Great flat with excellent location, about 5 minutes from Plaza Espanya. The flat is located on the third floor, was very clean and well-equipped.- Habitat Apartments reply: Many thanks for your opinion you have shared about your stay. We believe that true service is attentive, special and creates a feeling of being at home. It was our please to accommodate you and we hope to welcome you back soon. Thank you! Very nice apartment, you need to be more flexible with the check in time, sometimes it can't set an advanced. For some nights it is recommended to add towels and toilet paper. Apartment was clean & tidy & well dressed when we arrived, all equipment worked perfectly. Waking up to the big windows & the beautiful busy main road below was a treat. Local amenities are all very close by & the locals are all very friendly. Will come back again & if possible stay here again. The apartment ADN 31 is located in Sants area. Metro stop - 141 m.
Metro stop - 326 m.
Plaza de España - 0.38 km. Fira de Barcelona - 0.50 km. Foundation of Joan Miró - 1.64 km. Pros: Good apartment, comfortable beds, no outside noise in the 2 bedrooms. 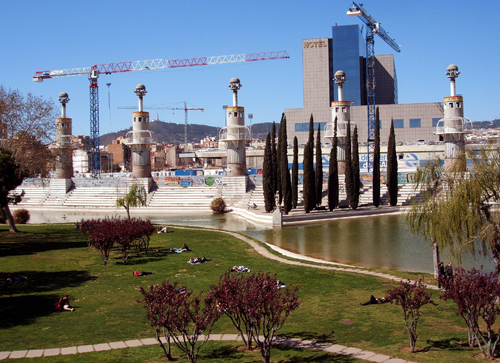 Location: 2 metro stops from plaza catalunya (less than 10 min by metro). shopping Mall nearby. Cons: one blanket was dirty so we could not use it (rest of apt was all clean). only one towel per person for the stay (I recommend you order extras in advance). Overall, would stay again and I do recommend. safe and good for kids and families. Very nice, comfortable, proper and fully equiped apartment in Barcelona close to the Placa Espania. The apartment has a nice 2 bed-room layout and with balcony and a big living room and kitchen. The kitchen is equiped with everything you need and very modern. For longer stays you even have a washing machine available. The are is nice and lots of shops including the Hostafrancs market and a big mall at the Placa Espania are in short walking distance. A very nice apartment. More than enough space for 2 people and clean. Like it a lot. Great location of the apartment. Nice apartment and very good location. We loved to drink cappuccino mornings in the bakery on the corner and buy fresh bread. Hi, We missed very much a vacuum cleaner. A clothes dryer or a possibility to hang up the washed clothes, so that wind can't fade them away, would have been nice. A "HOW TO USE" description for every machine in the house including the air condition would have been very helpfull. What annoyed us the most and was a huge inconvenience, is the fact that we couldn't check out later on last day, considering that we checked in later on our 1st day and that we booked 7months in advance. Habitat comments: Thank you for your feedback. We would like to inform you that we can provide vacuum cleaner upon request, but it´s not part of the apartment amenities. Concerning the clothes-horse it should be in the apartment, so we check why you couldn´t find it. We suggest you to call us next time during your stay, so we can provide solution immediately. The check-out is until 11:00 and you also have the possibility to enter to the apartment from 11:00 on the arrival day. Unfortunately the late check-out is not possible, however we offer alternative solutions where to store the luggages. The apartment was wonderful for us. A great location and well equipped. We loved that it had two balconies even though the front one one was small. It was great to be able to connect to the surrounding environment and it was so quiet once we closed the doors. The location was great, right next to a metro station and a wonderful bakery!! Our only issue was the shower head that didn't stay up properly. We didn't call it through so not complaining it wasn't fixed during our stay. Habitat comments: Thank you for your kind feedback. We really appreciate your remark concerning the shower head, we are going to fix it. El apartamento esta genial, muy bien ubicado, a escasos 15 metros de la estación del metro. Estuvimos 4 personas y perfecto, el apartamento esta reformado y es muy acogedor y confortable, la cocina con multitud de utensilios. Sin duda volvería. Recomendable. Appartamento molto comodo, in ottima posizione e tranquillo. Soggiorno a Barcellona molto piacevole, torneremo di sicuro! Nice apartment, with all you need for a holiday; very close to Plaza Espanya and Barcelona Sants. Cómodo, limpio y muy bien situado. A 5 minutos andando de la Plaza de España y de una parada de Metro. Como punto negativo, tuve que pagar 20 € por hacer el check-in después de las 21:00 hrs, sin haberme avisado previamente de esta circunstancia. Además la llegada la tenía prevista a esa hora, pero el tren se retrasó y por media hora de retraso tuve que abonar los 20 €. / Habitat comments: Gracias por su evaluación. Como se indica en nuestras condiciones, hay un pago de €20 euros para entrar a partir de 9 p.m.
EL apartamento muy bien, con todos los servicios, confortable y bien decorado. Los puntos negativos: -gotera en el techo -habitación matrimonio excesivamente estrecha -escasa atención al cliente en fin de semana. -ya podrían darnos 2 llaves y no una sola. / Habitat comments: Gracias por su evaluación. Normalmente damos dos llaves, lo sentimos por las inconveniencias. Agréable séjour dans cet appartement fraîchement refait à neuf, avec nos 2 garçons. La situation géographique est idéale, à 2 pas de la Plaza Espana. Proximité immédiate de petits restaurants raisonnables, de supermarchés, d'un centre commercial, des transports en commun. L'appartement dispose de tout le nécessaire, il est très propre, bien insonorisé, ce qui a contribué à rendre notre séjour des plus agréable. Nous avons notre point de chute, maintenant à Barcelone ! Elegant and luminous 2-bedroom apartment located in the traditional Sants district. Providing sleep up to 6 people and served by metro, train and buses. Features a lovely terrace.